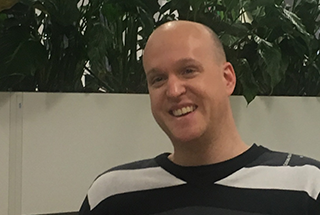 Ben joined Altmetric in September 2014 and looks after non-academic clients in the UK, as well as academic, corporate and government clients in Europe and the Middle East. He has been working in publishing for 11 years. You’ll probably see him at conferences, practising his “Outside Voice”. Ben studied English Literature, and buys far more books than he ever can read, mostly because he also has a daughter and a Playstation4. I’m responsible for that loud shouting noise that accompanies me every time I turn up at the office, often unannounced. Also sales for academic and corporate clients in EMEA and speaking at conference circuits mostly across Europe. In an average day I send what feels like eight hundred thousand emails, but is probably closer to fifty. A lot of the remaining time is spent trying to keep up with all the developments that our services undergo (those developers are quicker than fire-breathing laser rifles) and making sure our slide deck is up to date and is customized for each new client we speak to. And a lot of web meetings with prospective clients, colleagues and organizations we might be partnering with. The best part of my job is the people I work with. I almost wrote “Travelling Europe for free, lolz” but the colleagues I have beat even that fantastic upside. But only just. Watch the throne. The most interesting thing I’ve learnt since starting at Altmetric is that Barack Obama was the first sitting president to author an article for a journal (he actually wrote three – one on the present state of the legal system, one on clean energy and arguably the most famous one on the state and next steps of US Healthcare.) All three articles attracted immense attention due to his star power. The thing I’m most looking forward to next is my next meeting with a prospective client. The feeling I get when they are truly wowed by what our platform and data can achieve with a few clicks has not gotten old in 4 years, and I’ll happily spend many more years trying to evince that same feeling of magic when people first see what we do here.